It’s here folks – the Plymouth Blues Society second annual event is coming! After last years sell out event this one is sure to be even more popular – tickets are on sale now so be sure to grab yours before they’re all gone. Full ticket details can be found in the previous post. 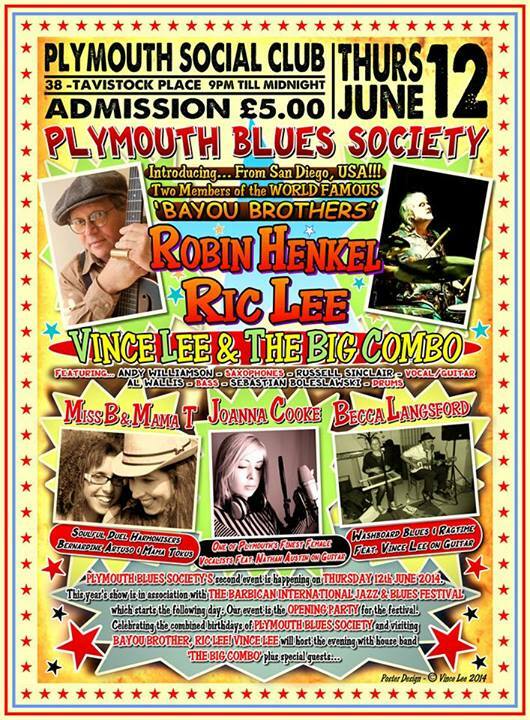 This years Summer Blues Party is headlined by Robin Henkel & Ric Lee on Thursday 12th June. This event is the opening party of The Barbican International Jazz & Blues festival which starts the next day so hope you can make it as it’s going to be an awesome night of Blues and related music from some of the best musical talent around town. Once again this extravaganza is the brain child of and has been organised by Vince Lee – does the man never stop ? Come along and enjoy a fantastic night – spread the word.